We have tried to make a range of really special savings available for our customers this Christmas. 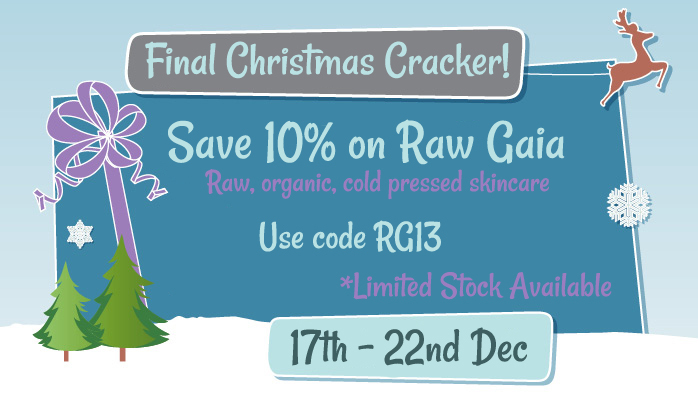 Here's the final one, running from the 17th to 22nd December only use code RG13 and save 10% on the Raw Gaia skincare This range is incredible, and that's why we stock it, and it is not only the most natural in the world, but really beautiful and effective too. Please note there is limited stock available, so it's first come first served, we will place "out of stock notices" on the page when we run out. You can still order, but we can't promise delivery for Christmas, but will do our best! Our final despatch is Mon 23rd, all orders placed before 4pm will be sent that day. (Stock permitting).